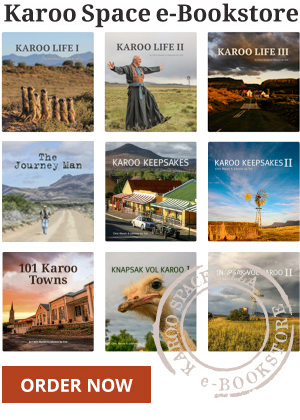 Last year in March we were heading back from a very long Karoo road trip when we passed Murraysburg and decided, on a whim, to attend a wonderful music festival in a poplar grove. 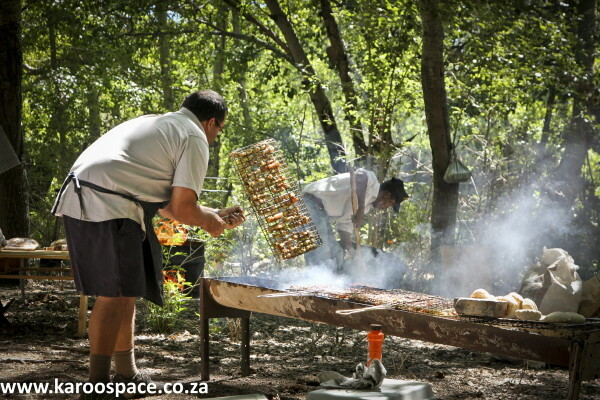 We’d heard from our informal Karoo network that everyone in the area was preparing to sell food or coffee or ice cream or just to go to the Stilfees on 20 March, so we decided what the heck. Road-weary as we were, we dropped in for a few hours and were charmed. 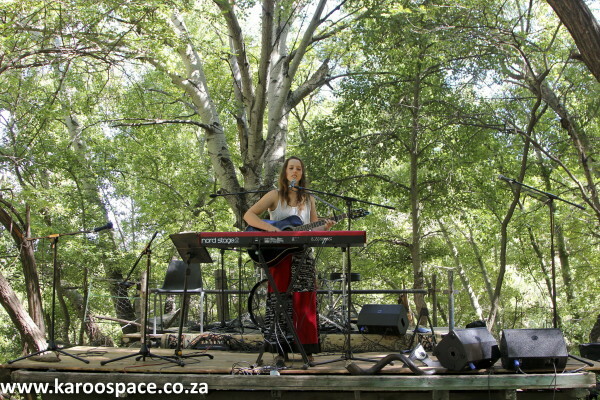 The Stilfees (The Quiet Festival) is held annually on the farm Grootdriefontein outside Murraysburg. The farmworkers guided us in, showed us where to park, and we walked to the dense shade created by the pale trunked poplar trees via the sheep kraal. What a good idea. Everyone was in a happy mood. This groovy grove gathering is all about relaxed people picnicking with gentle and interesting music (no cover versions), children and puppies, homemade artisanal food. People meandering between trees, lying on hammocks, lolling on the forest floor in the dense shade and coolth. Some artworks, paintings of farm scenes, were on sale on the small shed – farm scenes. It is all gloriously bucolic, and the people respond with smiles and laughter. The slow food section was near the entrance, and worth a tour of its own. There was Adri Smit selling iced teas (lemon, lime and mint or speech and apricot), or ginger beer, or water. Then there was Jenny Ballantyne of the Kweperlaan Guest House and Restaurant selling coffee and her homemade biscotti. And a group selling beesbiltong, sosaties, skaapstertjies and wors. We met the Avenant family, selling turksvy stroop and Spitskop wines. There was Karin Reynolds, who hosts the Stilfees with her husband Percy. She makes artisanal cheese including gouda and cheddar flavoured with peppeadew and olives, plus yoghurt with nastergal. No stabilisers or preservatives. There was Karoo Sushi. 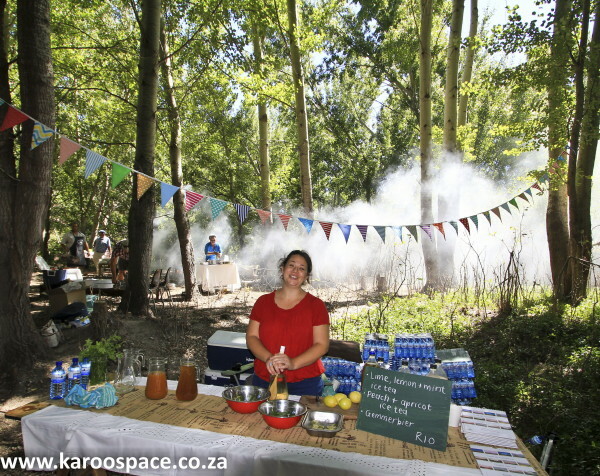 And Linda van der Berg who was constantly serving oreo, butterscotch, choc mint, granadilla or summer berry ice cream. Delicious. She ran out of chocolate first. Linda said she thought people would just have it for pudding, but from early in the morning, they were coming for the ice cream, handmade, and with real farm cream. “None of that vegetable fat nonsense,” she said briskly, wrinkling her nose. We had a brief chat with organiser Karin Reynolds. She radiated a relaxed serenity. What gave them the idea for the festival, she said, was a wedding that was held in this idyllic poplar forest. Then they held a ‘Volmaan konsert’ with just 80 people. They always just want original music, lekker luistermusiek from original local artists. They are lucky enough to know Joshua na die Reen, and he has been a real attraction. It is rustic, retro kind of festival, but the booking is quite sophisticated. 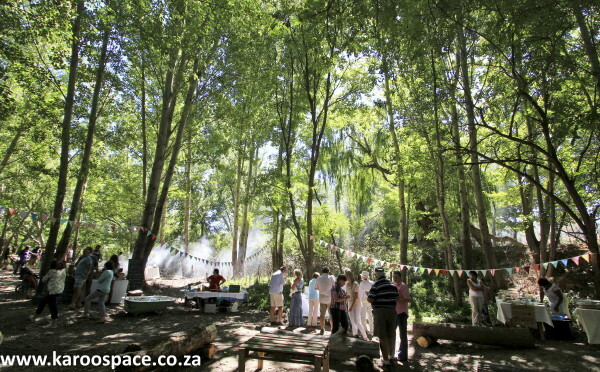 You have to book online at the Stilfees website and space is limited to a few hundred. 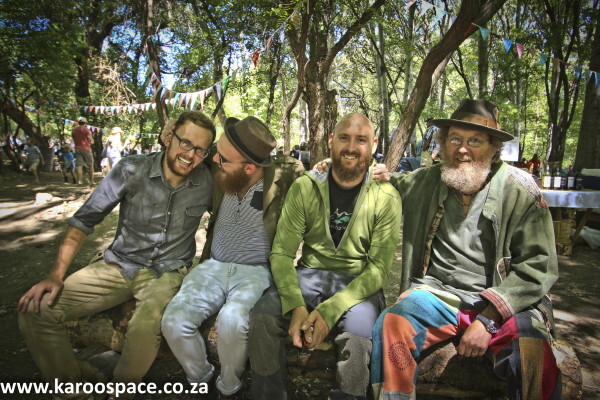 The 2017 (March 19) lineup includes Joshua na die Reen, acoustic harmony group Kaleidoskoop, folk rockers Bottomless Coffee, Afrikaans folk band Die Begin, a Djembe drummer called Jaco Spies and an indie folk musician called Jean Bateau. 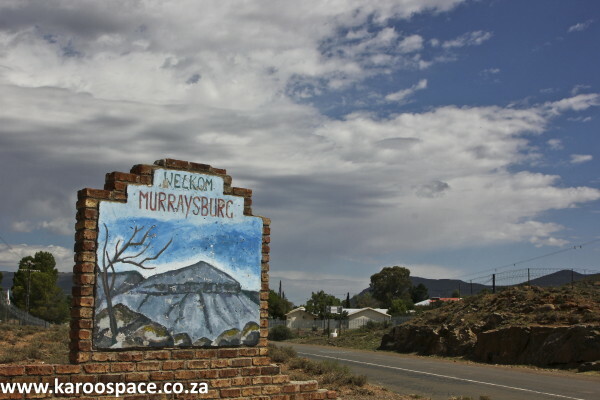 Murraysburg and the Stilfees await. Don’t miss out.